In the Disney Theory, I set out to connect various Disney movies to a single unified Disney Universe. A popular response to this post was that I was too late – that the Disney worlds had already connected several years ago by a little Disney/Square-Enix crossover project called Kingdom Hearts. As a gamer and Disney fan, I was definitely aware of the Kingdom Hearts series, but had written it off as an ‘alternative universe’. But spotting two certain Moogles in Wreck-It Ralph made me see that Kingdom Hearts is more significant to The Disney Theory than I realised. Kingdom Hearts was first released in 2002 as a collaboration between Final Fantasy developer Square-Enix and Disney Interactive. The game follows a young boy called Sora, who is pulled from his little island and given a mission from King Mickey to save the disappearing worlds of Kingdom Hearts. With the aid of Donald Duck and Goofy (and a weapon known as a ‘keyblade’), Sora travels to familiar Disney locations to fight the ‘darkness’ that is disrupting them and help Disney characters bring order to their worlds. Kingdom Hearts does not pay much mind to rules of physics and scale. 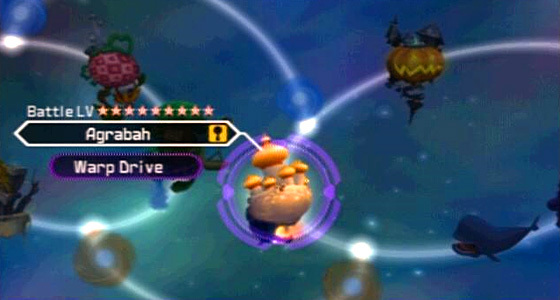 Disney worlds in Kingdom Hearts are depicted as individual planets floating out in space, but there are still plenty of ways to travel between them for those with enough motivation and awareness of those other worlds. For example: using the Star Shard is unpredictable, which is why Mickey appears in random unlikely places; meanwhile, walking through the Corridors of Darkness corrupts the heart, and is only for the heartless, nobodies like Organisation XIII, and the truly evil. And then there’s teleportation between worlds, which Merlin and Maleficent both prove possible as Maleficent appears in various worlds and Merlin is even able to transport others. This provides a significant link to The Wreck-It Ralph Theory, where I observe that ‘glitches’ act similarly to Disney’s magic users, and its likely that their ‘magical’ abilities are not what allow them to travel to other worlds but are actually a result of them doing so. 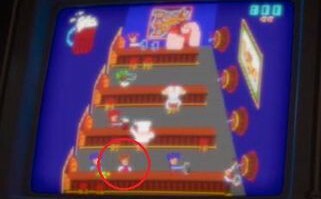 Many have pointed out that this patron of Tapper’s in Wreck-It Ralph could be Sora himself. Maleficent is also one of the few Disney villains to present a genuine threat outside of her world, which will be explored deeper when we question Kingdom Hearts‘ perspective on good and evil. …all the Disney worlds were connected. 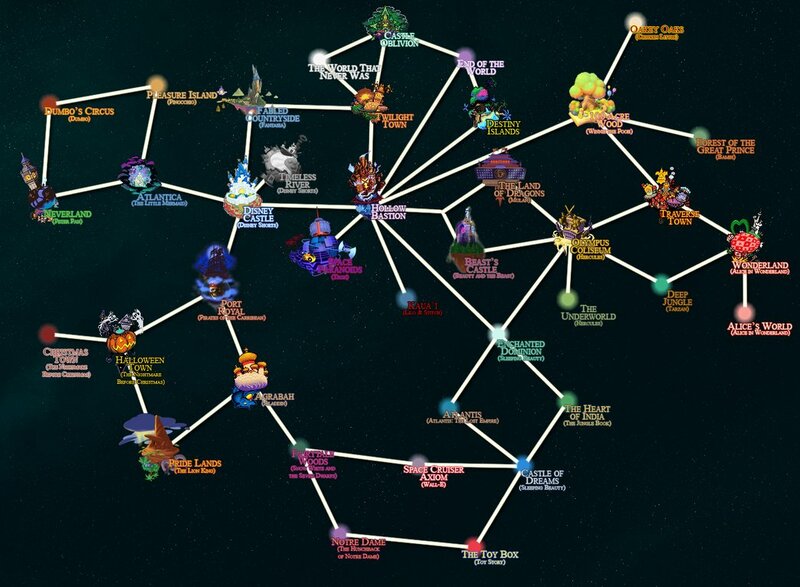 The many connected worlds of Kingdom Hearts (with a few Kingdom Hearts 3 suggestions by nakashimariku). In Kingdom Hearts: Birth By Sleep, Kairi’s grandmother tells her a story of a time where all the worlds were connected in light. Darkness crept in when people began to fight over the light, and that is how the worlds became separated. Kairi’s grandmother speaks cryptically, but she says that the world was only saved because ‘small fragments of light survived in the hearts of children’, and the worlds were scattered until the day ‘a door to the inner-most darkness will open and the true light will return’. Kairi’s grandmother is actually telling a fairy-tale version of the Keyblade War, where keyblade wielders fought to control the great power source known as ‘Kingdom Hearts’. 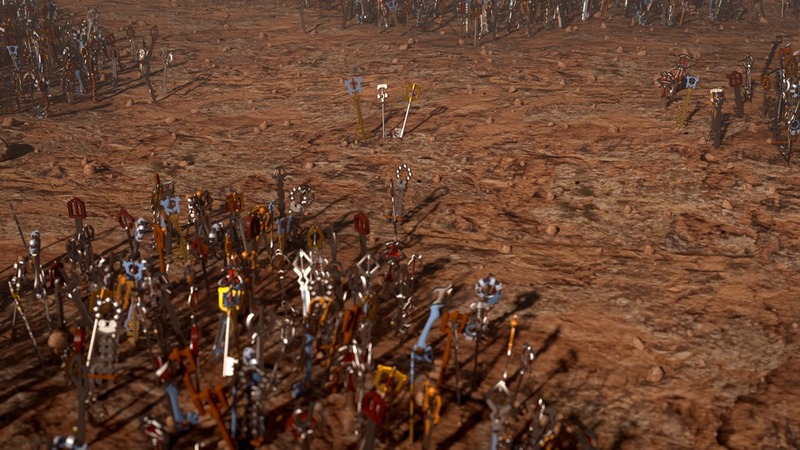 The ‘Keyblade Graveyard’ – one of the remnants of the Keyblade War. The fact that there was a time when all the Disney worlds were combined as one kingdom explains Disney Theory anomalies like Pinocchio and Pumbaa, who appear in various Disney settings with little logic or reason. There is also an interesting idea that reflects The Wreck-It Ralph Theory that true ‘evil’ is not supposed to exist in the Disneyverse. Ralph is a badguy, but that doesn’t mean he’s a ‘bad guy’, which makes me wonder whether the same was true in the Disneyverse before the worlds separated. Did Maleficent and Jafar exist in their worlds before the darkness, or are they a product of it? Were they benign antagonists before the Keyblade War, who now exist as corrupted ‘King Candy’ versions of themselves? 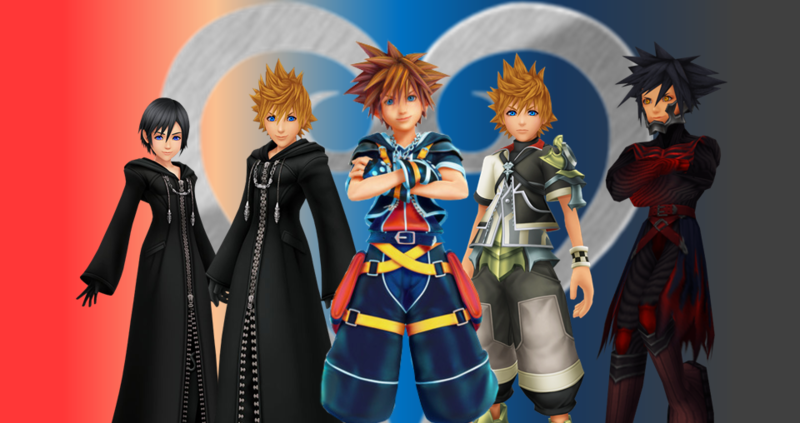 Nowhere is the idea of duality more obvious than in Sora and his alter-egos. 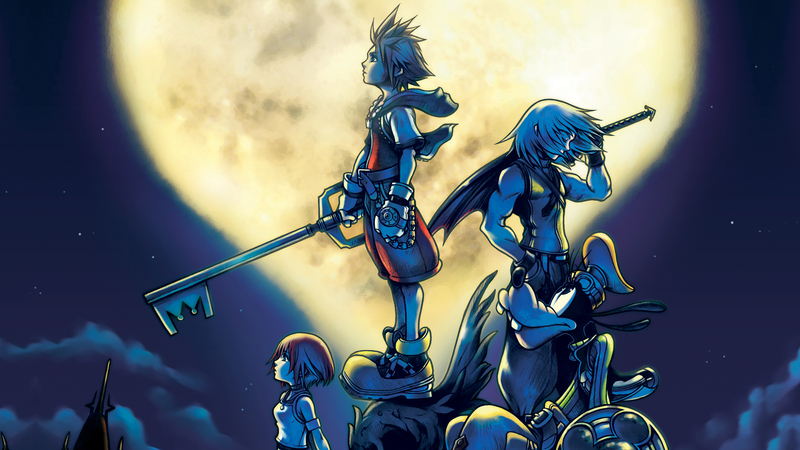 The mythology of Kingdom Hearts is quite clear that it’s normal to have light and dark sides of yourself (see: Sora, Riku, Ansem, Terra) and there is also message of balance throughout the series (it’s often argued in the series whether Kingdom Hearts itself is pure light or pure darkness). With that in mind, when Master Xehanort says he’s trying to end the ‘tyranny of light’ it almost makes King Mickey sound like a despot. Does the Disneyverse demand a balance between the powers of ‘good’ and ‘bad’, and does it self-correct when faced with all good (Fix-It Felix) or all bad (King Candy)? It would explain how the same tales of evil stepmothers and adventurous orphans keep repeating in a perpetual balance; almost as if they’ve been thrown in to limbo by the Keyblade War’s epic clash. It also begs the question, what happens to these Disney worlds if light finally defeats darkness in Kingdom Hearts III? Image | This entry was posted in The Disney Theories and tagged Disney, Games, Head Canons, Movies, Theories, Wreck-It Ralph. Bookmark the permalink. Just finished reading and wow i am completely blown away i pride myself on finding movie mistakes and pointing out stuff like the mulan poster in lilo and stitch but damn dude this was amazing i love it magnificent work really really brilliant keep it up and just fyi this is better than the pixar theory by far. This makes me wonder if the Pixar and Disney theories are somehow connected (I noticed the Toy Story world in the Kingdoms Hearts universe…)? Bummer – can’t get this one to come up & I am a big lover of KH. Hope the text is back soon! Apologies! This has now been fixed. This world has been connected…tied to the darkness…soon to be completely eclipsed…there is very much to learn…we understand so little…a meaningless effort..those who know nothing cannot understand nothing. Thanks for fixing the issue!!!! I was wondering, do you think Maleficent (2014) fits into the Kingdom Hearts universe, at all? Because *spoiler alert* the events of Maleficent deeply contrast with the original Sleeping Beauty. Wow I have been up all night reading the theories that you have about Disney! I absolutely was blown away by the Pixar theory!!! I found your article quite fascinating, however, something it causes me to ponder: if the universes are connected, wouldn’t a lot of animals, i.e. : warthogs (Pumbaa), squirrels (Wart), dogs (Little Brother), deer (Bambi’s mother), etc, look alike? Also, How exactly would the events of “Who framed Roger Rabbit” fit into the theory? here’s a thought, what if Disney infinity is before the war where the different worlds were still connected. Nice job on this one…now to tie together Who framed Roger rabbit(with it’s character erasing substance known only as “the dip”) to the game Epic Mickey (with its very identical paint thinner substance which happens to erase cartoons as well, plus the removal of characters “hearts”) with kingdom hearts and the rest of the disney universe theory. They are connected I swear!